An astronomical number of data streams are being generated every day because data is core to diverse systems. Today’s business owners have come to recognize data as an important factor during decision making. However, the gathered bulk data would be confusing to read and useless without a way to visualize it. For this reason, realtime monitoring systems have gained popularity over the years. We can use such systems to visualize website traffic, weather updates, server performance and so on. In this article, we will build a realtime monitoring graph that continuously displays updates on website traffic after a fixed interval. We will build a Go backend server that exposes several endpoints and uses Pusher Channels to trigger events on the count of user visits. We will simulate the website traffic data using a simple setInterval function and a pseudorandom number generator. From the image above, we can see that there is a button labeled Simulate user visits, this button is responsible for starting the simulator on the Backend server. Let’s begin. An editor like Visual Studio Code. Go (version >= 1.10.x) installed on your computer. Heres how you can install Go. Create a new file called graph.go. Now, before adding content to this file, we need to install the Go packages that we will be referencing within our application. The graph.go file is the main entry point of our backend server so this is where we import all the packages we previously pulled in. We import the time package because we will need it to create a new ticker for our custom setInterval function. We import the math/rand package because it provides the pseudorandom number generation. Next, registered a new Pusher client with the credentials from the app we created earlier. We defined the main function (this is where the application starts its execution) and created a new echo instance. In this application, because we will serve the static files that define our frontend from the backend server, we need to let Go know about them and their location. In the main function, we registered the routes that will serve these static files that we will create shortly. We also defined a “/simulate” route that takes a simulate handler function and responds to the GET HTTP verb. Lastly, we instruct the echo instance we created to start the application and listen on the port 9000. Within the simulate function, we called a setInterval function and within it we seeded a new random number using the time.Now() function. We also instantiated a new visitsData object with the name newVisitsData and initialized both the Pages and Count fields using randomly generated numbers. We set the interval between running the logic to 2500ms. Lastly, we use the Trigger method on the client object to broadcast an addNumber event over the visitorsCount channel. In this tutorial, we will use Chart.js; it has a fairly simple API and renders robust charts using the HTML canvas tag. It is also able to update the chart without completely re-rendering it and this is what we need since we will be rendering Pusher updates. We will also instantiate a new line chart object passed in a chartConfig object as an argument, this chartConfig object will supply the data that will define the line chart’s properties. 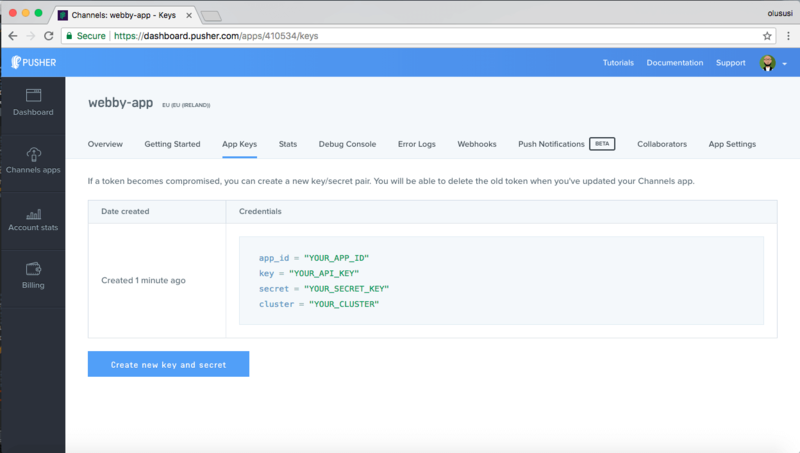 ⚠️ Replace PUSHER_APP_* keys with your app credentials.